I am so excited to introduce you to the #toolsforlearning series!! Every Tuesday an awesome team of bloggers will be taking on the challenge of activities with common educational manipulatives! We want learning to be hands-on, interactive and definitely fun!! Follow the #toolsforlearning hashtag on Instagram to see all the amazing activities & share your own using the manipulative of the week! 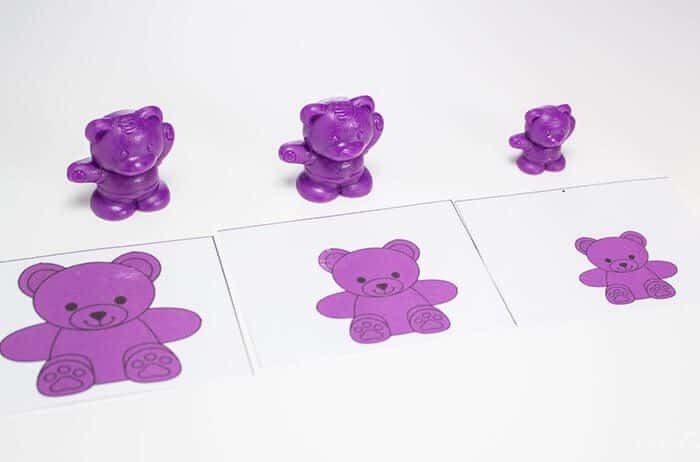 We’re starting off the series with rainbow counters: bears, animals, all things rainbow! 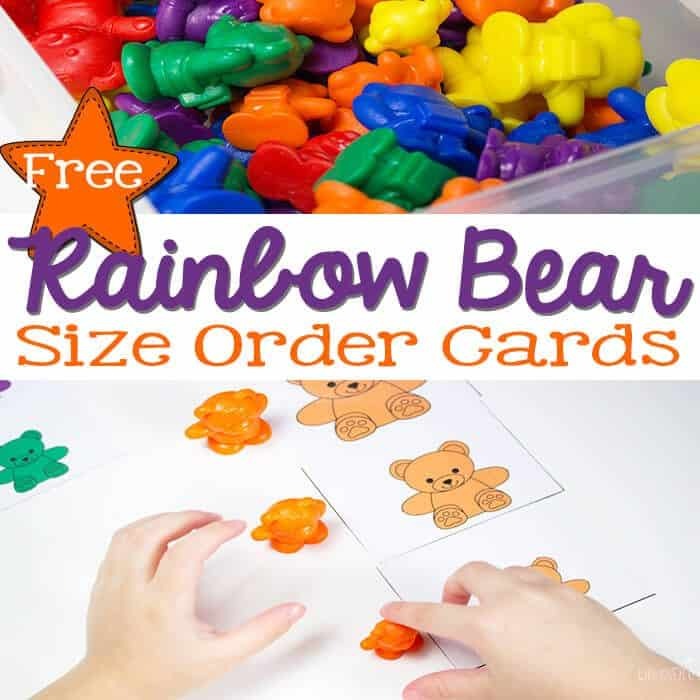 Like these Size Order Rainbow Bear Cards. 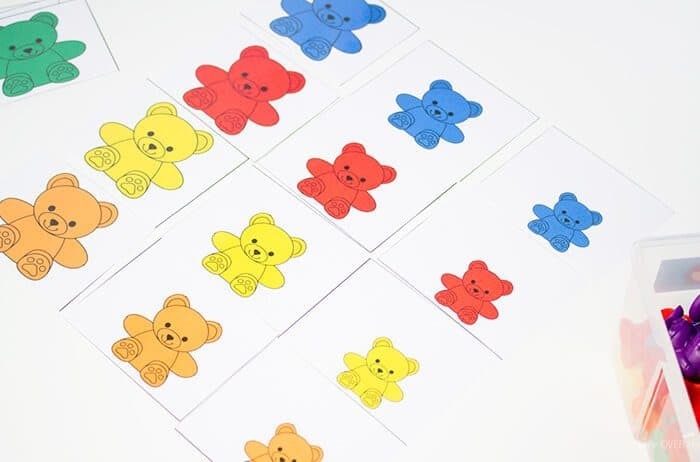 To Prep: Print the Size Order Rainbow Bear Cards, laminate and cut them apart. We started by doing an example row. I showed Shiloh how to put the cards in order with large, medium and small. Then she tried. 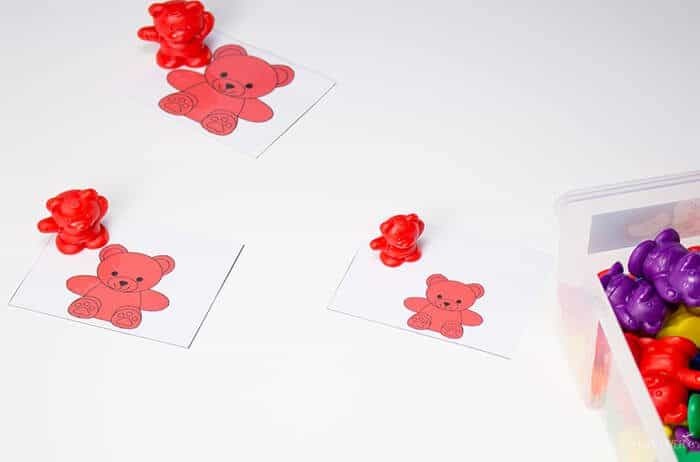 She is really great at self-correction when it comes to colors, so even though she tried putting the wrong color in her row, she quickly realized that it was wrong and placed it in another row. 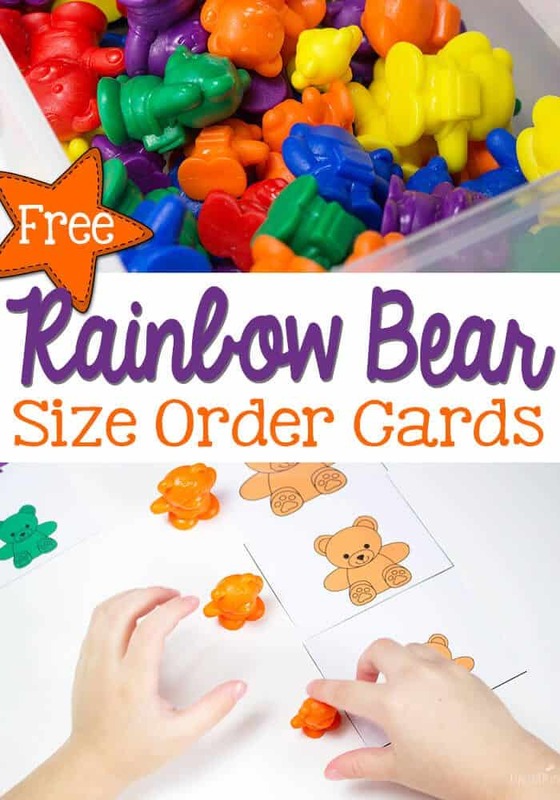 Then we worked on matching the cards with the rainbow bear manipulatives. We tried them horizontally. Then vertically. It’s really important that kids realize that size doesn’t just apply to pictures on a paper. 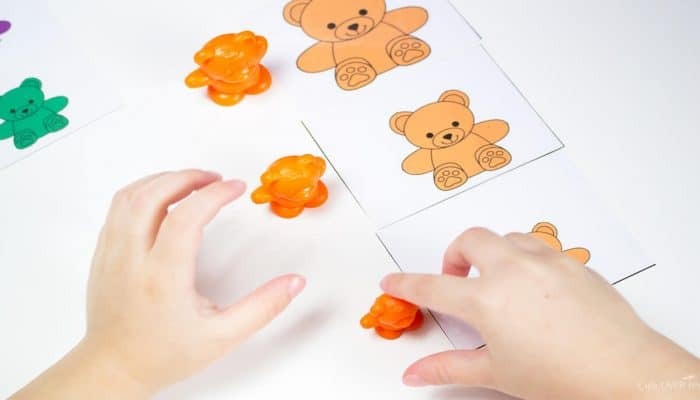 That’s why the rainbow bear manipulatives are great for this activity. 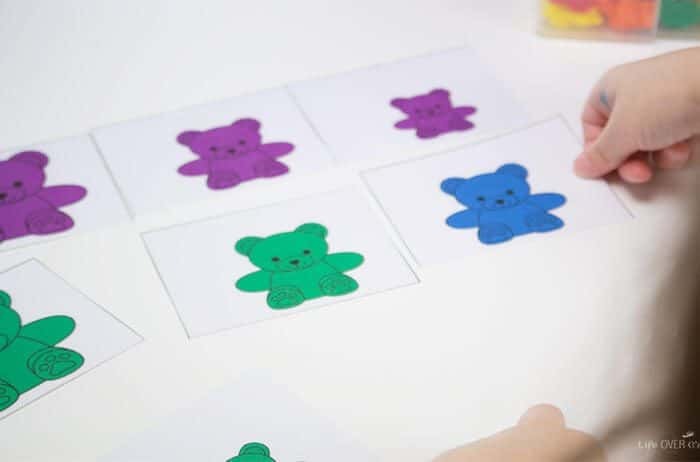 I really like the Thinking Kids Math Bears that we have because they can be sorted with both six different colors and three different sizes. They cost a little bit more than some other brands of rainbow bears, but it has been totally worth it for us. 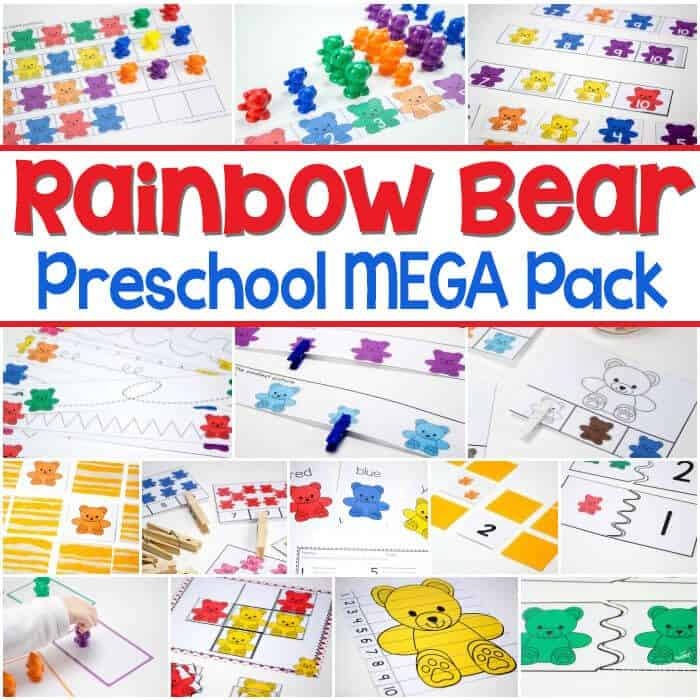 And this awesome Rainbow Bear Preschool Mega Pack! 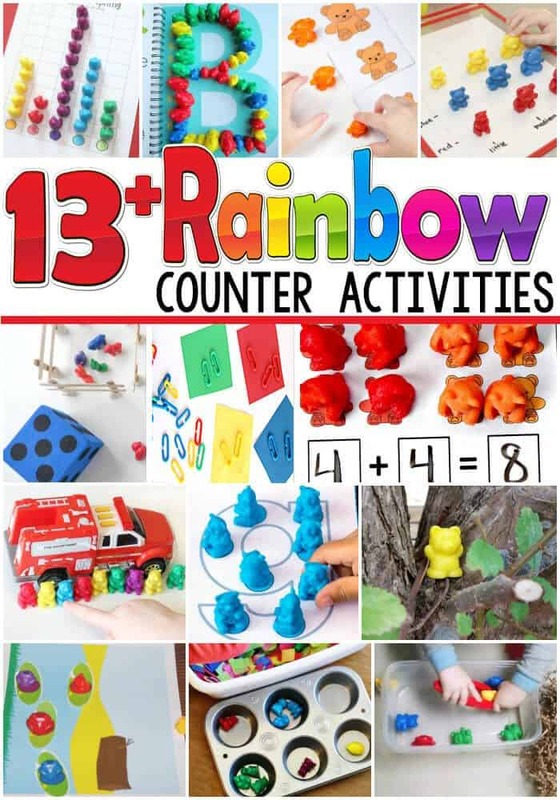 Need more ideas for using your rainbow bears or rainbow counters? Check these out!! 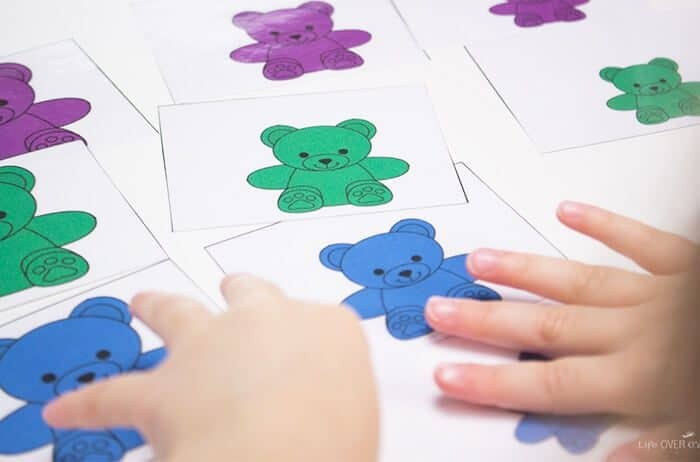 Don’t forget to use #toolsforlearning on Instagram to share your Rainbow Bear & Counter learning activities!! Your newer bears are so cute. I love that they’ve added orange and purple and little packs on their backs. 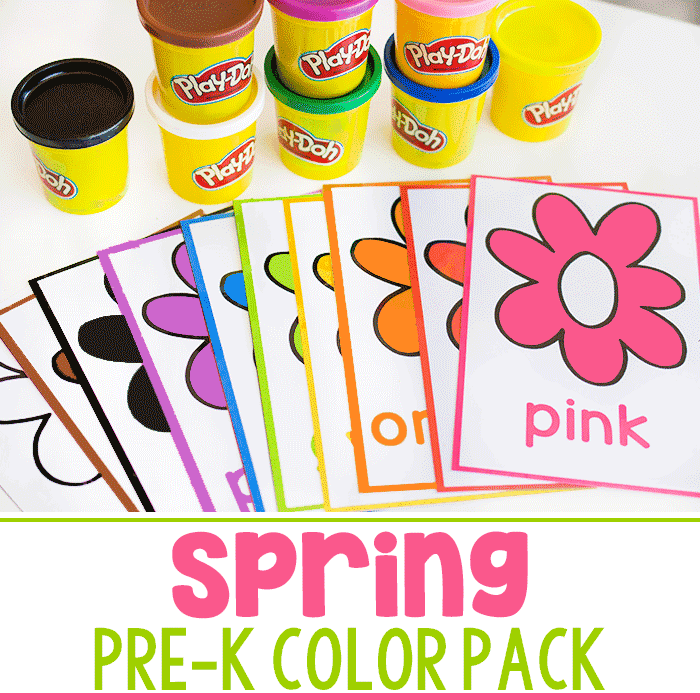 Your printables look amazing. This is the Carson-Dellosa set. The Learning Resources set is slightly different. 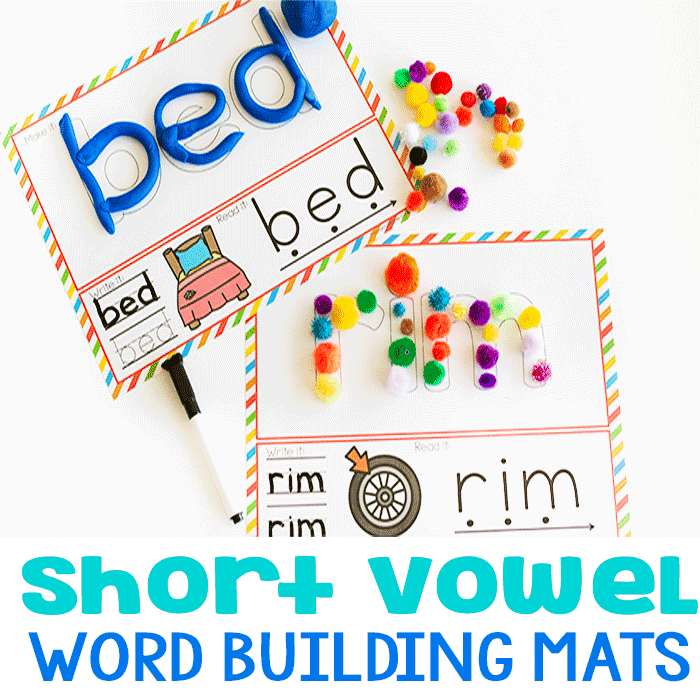 Printing now-thanks for sharing such a great activity! My daughter will love this! 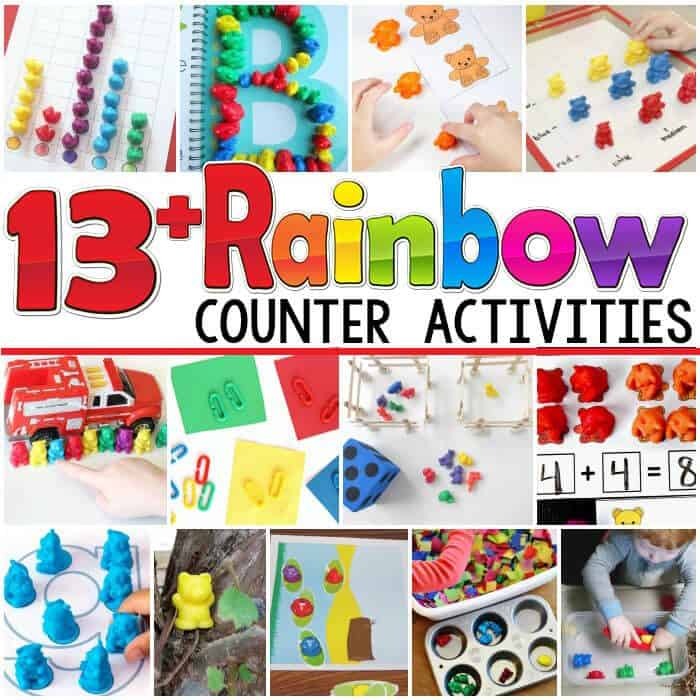 So many fun ways to learn with rainbow colored manipulatives! I, too, love that they created a set with orange! 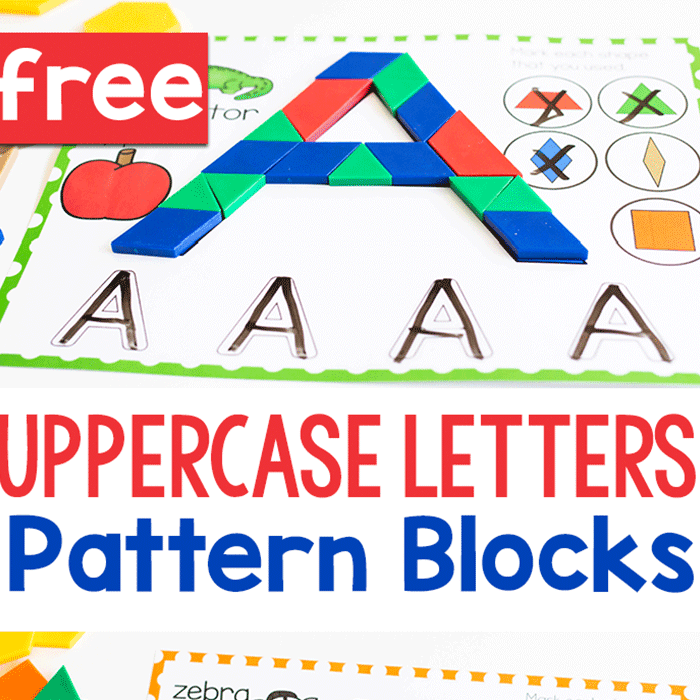 Wow – what amazing printable resources. I shall be passing these on to my teacher friends! So fun! I now feel very compelled to buy the bears in different sizes so I can do activities like this!